The Group IRMENA has been granted funding for its Research Project “Transnational Dynamics and Actors in the MENA Region: A historical Genealogy of Elites and Social Movements in between the local and global level”. The project will run until 2020 and it is led by Prof. Laura Feliu and Prof. Ferran Izquierdo. The configuration of the regimes of power ((Izquierdo Brichs, 2012) and (Izquierdo Brichs, 2013)); its relationship to social mobilization (Feliu & Izquierdo Brichs, accepted pending of publication); and its relationship to global dynamics, which involves both global elites and transnational social mobilization. The first two aspects have been studied and developed in R+D+i projects CSO2008-06232-C03-02 / CPOL, led by Dr. Ferran Izquierdo, and the HAR2012-34053 project, led by Dr. Laura Feliu. The third aspect, the impact of global dynamics, represents a novel axis added to the previous work, and it will be especially considered in this project. Against this backdrop, local tensions are partly a product of global and regional frictions that may influence the accumulation processes of global and regional power, either by generating or subtracting capabilities to some actors. On these occasions, global and regional actors try to influence local actors. When this influence is exerted from the States and affects the geographical space, the geopolitics understood in the classical sense, is present again. resources are closely linked to the control of energy resources, thus the geography is crucial. Moreover, territorial tensions in Libya and especially in Syria as a result of civil wars, added this new geopolitical factor in a region that had not solved the border problems inherited from colonialism. However, the interactions increasingly occur with the participation of non-state actors, hence the classical geopolitics can be considered as limited to the analysis. Therefore, we will reflect about the links of geopolitics and globalization processes, and apply the resulting analytical framework to the relations between the global-regional-local levels and to the tensions occurring throughout the Middle East and North Africa. We want to link these three axes, taking into account the historical dimension and its relationship to the present. 3rd February, 1991. 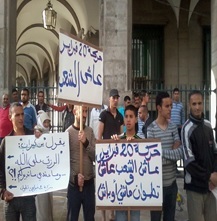 Hundreds of thousands demonstrate in Rabat against the Gulf War, L’Opinion. social movements; global elites; power regimes. We are happy to announce the seminar ‘Security Sector and its Reform in the MENA Region’, which will take place on 25th May 2017 in Barcelona, Spain. . The seminar is part of the research project “Security Sector Reforms (SSR): the need for a socio-political analysis”, which focuses on the Security Sector in the MENA region. The project is coordinated by Prof. Dr. Laura Feliu (Autonomous University of Barcelona) and funded by the International Catalan Institute for Peace (ICIP). The Call for Papers is out now (cfp-ssr-seminar). The deadline for submitting abstracts for papers is January 31st, 2017. The seminar ‘Security Sector and its Reform in the MENA Region’ will be held in Barcelona on the 25th May, 2017. The seminar is organized in the framework of the research project “Security Sector Reforms (SSR): the need for a socio-political analysis”, coordinated by Prof. Dr. Laura Feliu and funded by the Catalan Institute for Peace (ICIP). The selected papers will be published in a special journal issue. – an excessively technical implementation off SSR programs and a failure to integrate the political dimension. The mainstream debate on SSR revolves around the discrepancies between theory and praxis. Nevertheless, the true obstacle remains to our opinion that of SSR becoming a real instrument for political, cultural and institutional change from an autochthonous approach. New proposals and case analysis are thus needed outside the SSR orthodox theoretical framework, so far based in the principles of liberal peace, of technical and bureaucratic approaches to state building and to a security-development nexus that underlines the idea that only SSR programs can secure the ‘development’ of ‘receiving’ States. (Chandler 2010). The culpable of violence and poverty is in this framework the fragile State, or the State lacking institutions or knowledge to maintain security. The state’s inability legitimizes foreign intervention and the strengthening of certain local elites. The failure of SSR is a theoretical one as it ignores the political dimension, does not dig deeper into fundamental concepts such as local ownership, and eludes the debate on the adequacy of neolibreal globalization and its role in each context. The failure is nevertheless practical in that SSR has not been applied with the philosophy and goals of ‘governance’, nor with the necessary coherence that external actors’ rhetoric announces. We face a debate about the convenience of discarding SSR, of deepening its true meaning for change and transformation of the security sector, or of simply avoiding the label and focusing on the need to reform security systems. The hegemony of the perceived ‘terrorist threat’ as a global threat seems to dismiss the philosophy of the SSR proposal, prioritizing a new ‘hard security’ within the global narrative and rather perverting SSR into a stand-alone tool for enhanced military assistance. We do not intend to elude the need for a transformative analysis of security systems, merely by critically pointing at international SSR programs. We are on the contrary trying to bring a closer look, a local or autochthonous viewpoint, without ignoring the effect that any transformation or reform performs on local populations, as well as regarding power relations (between global elites and local elites, among local elites themselves or between elites and local populations). SSR in the Arab World. The debate on the SSR did not penetrate the Arab region during the 90s, nor during the early 2000s (Luethold 2004; Sayigh 2007). Despite the investment of EU and some member countries (UK, the Netherlands) in SSR, most SSR interventions had so far been limited to South-Saharan Africa (Guinea-Bissau, Congo, Sierra Leone). SSR was in fact conceptualized for post-authoritarian and post-conflict contexts. The only case where the EU has funded SSR in the MENA Region is in the post-Oslo Palestine (Mustafa 2015). After the 2011 uprisings, some authors advocate a debate on SSR for the region (Luethold 2004) in order to build an autochthonous agenda that will overcome the international donors’ rhetoric and practices (Sayigh 2007). Some wonder if SSR is even possible without radical change or without a total crisis in a region where security sector is often the backbone of regimes. SSR might in fact be in need of a more holistic approach, a change based in human rights and dependent on civil society’s and activists’ agendas and tempus. (Sayigh 2007; Kodmani and Chartouni-Dubarry 2009). To discuss the research approaches on the security sector and their implications for SSR policies. Authors must send an abstract of their paper (max. 400 words) with their name to: Blanca Camps-Febrer blanca.camps@uab.cat before the 31st of January 2017. The selected papers must be submitted before the 31st of February 2017. Articles may be submitted in English, French or Spanish.Funding will be available in order to cover the participation costs for at least one of the selected participants. Preference will be given to those without funding and students. Chandler, David. 2010. International Statebuilding: The Rise of Post-Liberal Governance. Critical Issues in Global Politics 2. London  ; New York: Routledge. Jackson, Paul. 2011. “Security Sector Reform and State Building.” Third World Quarterly 32:10: 1803–22. doi:10.1080/01436597.2011.610577. Kodmani, Bassma, and May Chartouni-Dubarry. 2009. “The Security Sector Reform in Arab Countries: Can It Be Reformed?” Institute of Development Studies Bulletin 40 (2): 96–104. Luethold, Arnold. 2004. “Security Sector Reform in the Arab Middle East: A Nascent Debate.” In Reform and Reconstruction of the Security Sector, 93–118. Münster: LIT Verlag. http://www.dcaf.ch/content/download/36141/527499/version/1/file/bm_ssr_yearbook2004_5.pdf. Mustafa, Tahani. 2015. “Damming the Palestinian Spring: Security Sector Reform and Entrenched Repression.” Journal of Intervention and Statebuilding 9(2): 212–30. doi:10.1080/17502977.2015.1020738. Riis Andersen, Louise. 2011. Security Sector Reform and the Dilemmas of Liberal Peacebuilding. Copenhagen: DIIS – Danish Institute for International Studies. Sayigh, Yezid. 2007. “Security Sector Reform in the Arab Region: Challenges to Developing an Indigenous Agenda.” Thematic Papers. Arab Reform Initiative. http://www.mafhoum.com/press10/312P10.pdf. Sedra, Mark. 2010. “Security Sector Reform 101: Understanding the Concept, Charting Trends and Identigying Challenges.” The Center for International Governance Innovation (CIGI).